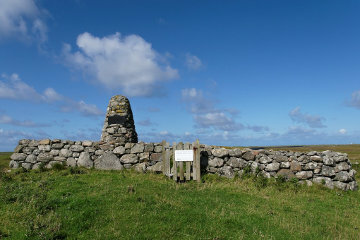 A short distance north of the excellent Kildonnan Museum we saw a sign pointing off the road to the "Birthplace of Flora MacDonald", so I had to jam on my brakes - no need to check if there was anyone behind me on the deserted roads of South Uist - and pull a hard left. The birthplace is just the walls of what must have been a comfortable dwelling (for the time), in the middle of which is a large stone cone bearing a plaque confirming that this is the very spot. Dotted around are the remains of other houses, so back in those days Milton must have been a thriving little village. Today it is grassy meadows and wide open views, with the only sound the perpetual sighing of the wind and the lonely cry of some bird that has lost its way. 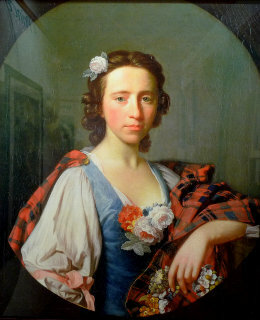 If you've not heard of Flora MacDonald before, she was the girl who risked everything to help smuggle Bonnie Prince Charlie off South Uist and over to Skye, where he could board a ship to escape back to France. She loaned him a dress and bonnet and then had him ride behind her as her maid while she brazened her way through the soldiers hunting for the prince. After all that the ungrateful swine didn't marry her - didn't give her a second thought, so far as history tells - yet her picture shows that she was not unpleasing in appearance and certainly her devotion and courage deserved some reward. On the other hand, Bonnie Prince Charlie seems to have been a snobbish prig who thoroughly deserved to be chased out of Britain, so perhaps she was lucky after all.